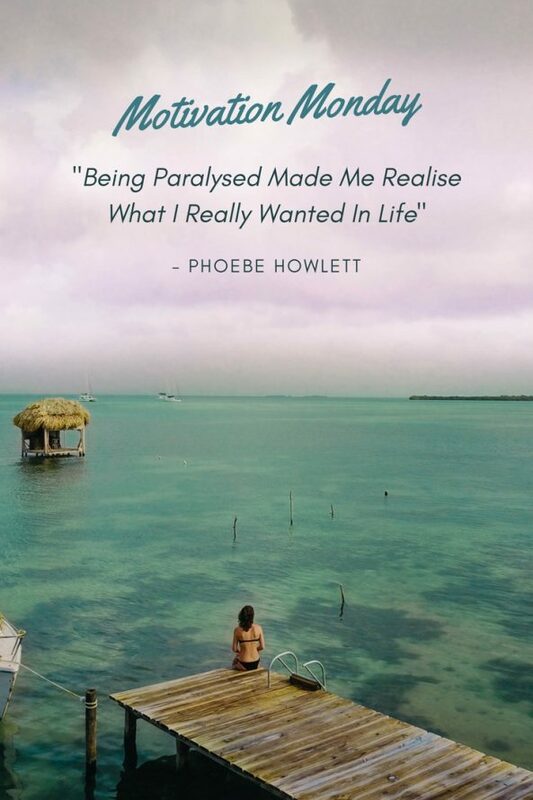 Phoebe Howlett intends to be the first chronic illness story to travel to every country in the world, documenting it on her website and social media channels. This is her story as to why. [dropcap size=big]I[/dropcap]’m lying on the floor , the floor of Holborn tube station in London to be exact. Commuters are looking worriedly down at me, asking ‘Where I’m going? or ‘Who they can contact?’. I’ve fainted again, this usually happens in the morning at home, or getting up in the middle of the night. But on the tube, this was a first. I’m panicking, I can hear all these questions shooting at me and I don’t know an answer to any of them, my brain these days feels like it has a thick mist over the entirety of my thoughts. The fact I couldn’t remember the answer to where I was, is a sinking realisation that something is so very wrong. Along with this single incident the silent and invisible symptoms slowly crept up on me over a period of six months or so while on my shoulders I had a messy break up, a £100 million pound sales target at an investment firm, and a mum battling cancer. I remember a friend describing ‘the worst hangover of her life’. She had the shakes, it felt like her brain was exploding behind her eyes, her whole body was shaking it felt so weak, nausea washing over her every 10-15 minutes paired with complete exhaustion. That’s what it felt like, every day for me. She dubbed that ‘as one of the worst days of her life’, one of the worst days of her life was just a normal day of mine. It took six arduous months for doctors to diagnose me with two rare chronic illnesses PoTS and M.E..
PoTS, or Postural Tachycardia Syndrome, is an abnormality of the functioning of the involuntary nervous system. To be diagnosed with PoTS, an individual must experience a substantial heart rate (H.R) increase, my resting H.R was 67, while my standing H.R was 111. M.E., or Myalgic Encephalomyelitis is a chronic fluctuating, neurological condition that causes symptoms affecting many body systems, more commonly the nervous and immune systems. The immediate relief of being diagnosed was overshadowed by there being no cure for either illnesses. Doctors threw around the phrase ‘learning to manage your expectations of life’, the therapy I was advised to take was not based on recovery but me getting comfortable with having these illnesses long term. Everything I knew to be normal – socialising, jobs, fitness and sports – all that was en-grained in me as to what made a person the best they could be, stopped there. But I powered on with my job, spending that period of my life appearing to be stronger than I was at work and then collapsing into bed at 8:30pm. I battled uncompromising HR policies, abusive managers, and took pay cuts, all to keep my life in London. But in December 2015 I had the worst month of my life to date. Along with my M.E. & PoTs, I also had infections in my chest, both eyes, sinus. and bladder. I was completely bed bound, my PoTs went through the roof and I woke up laying in the dark to stop my migraine, with no feeling past my thighs. The initial terror that comes with the realisation you can’t feel your legs is indescribable. I knew this was possible, it is often a symptom in extreme cases of PoTS. But from my doctors patronisingly throwing around the term a ‘mild case of PoTS’, I didn’t think this would happen to me. My plan had always been to have a few years in London and then to travel. But with this I realised that the opportunity of travel had now been taken away from me. Thoughts started racing, what was I doing, why an earth was I battling to keep my ‘London life’ when it was simply a means to allow me to travel?. Why did it have to take no feeling in my legs to realise what was most important to me? It’s a question I still ask myself today. Being paralysed with PoTS is different to the stereotypical paralysis patient. Imagine you’ve been sat in an awkward position, you get up and have a ‘dead leg’. This is what it felt like, up until the middle of my thighs. Just like you get with a dead leg coming round again, I had constant waves of painful cramp and pins and needles coming and going in waves down my legs. But this was a good sign, it meant the nerves were trying to work and the feeling of my legs was slowly coming back. By April 2016 with a lot of time of going in and out of work still suffering with numerous infections and pain in my legs, I had moved to my family home, happily saying goodbye to my life in London to properly recover. Recovery for me was frankly a miracle. The struggle of it all had so many set backs. 30% of people with chronic illnesses are also diagnosed with and suffer with mental illness like I did, the uphill battle of recovering from an illness no one can see felt so isolating, I felt as though I had tried every alternative therapy known to man. But in the end I did recover, by March 2017 my doctors officially signed me off as in remission. The last two years of my life decisions were only ever made about my health, the first thing I thought with the word ‘remission’? I now have choices. I now have choices in my life that were taken away from me for what felt like so long. The journey with my health has given me complete clarity of what I want from life. 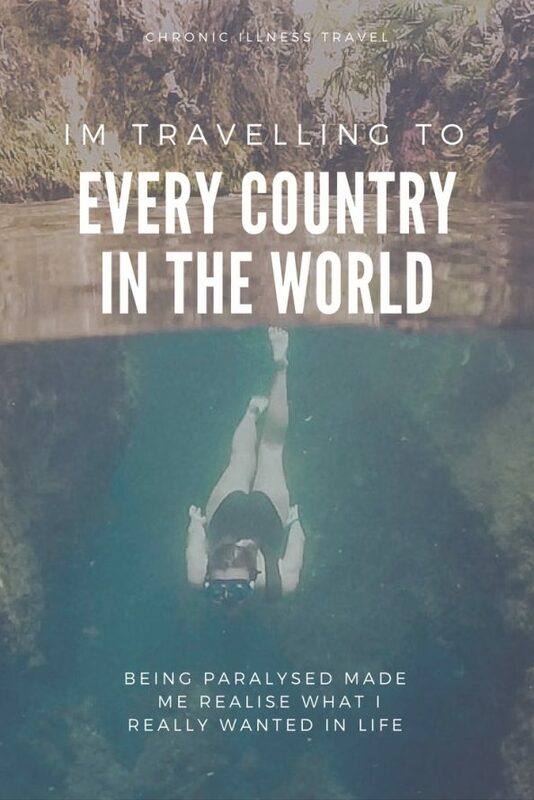 I have now set myself a challenge, to become the second woman in history to visit every country in the world, being the first chronic illness story to do so. 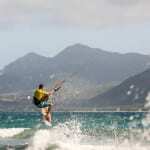 While doing this I present to the younger generation all over the world about my battle with health and my challenge. My hope is that my story can make discussing invisible illnesses; mental or chronic an open one along with inspiring them to go for what they dream of, gender irrelevant. I am a woman, doing this alone and nothing of my plan scares me compared to what I have been through. I’ve swam with sharks, skied in the dark, hiked volcanoes, and seen wonders of the world. To everyone lucky enough to have the opportunity to travel: go and do what you really want as soon as it is feasible, because the opportunity of that choice could be taken away from you in a second. Follow Phoebe on Instagram, Facebook, Twitter, and Youtube to hear more about her adventure. Phoebe intends to be the first chronic illness story to travel to every country in the world, documenting it on her website and social media channels. Follow her on her blog Chance Of Choice to experience the adventure with her.